It's that time of year. 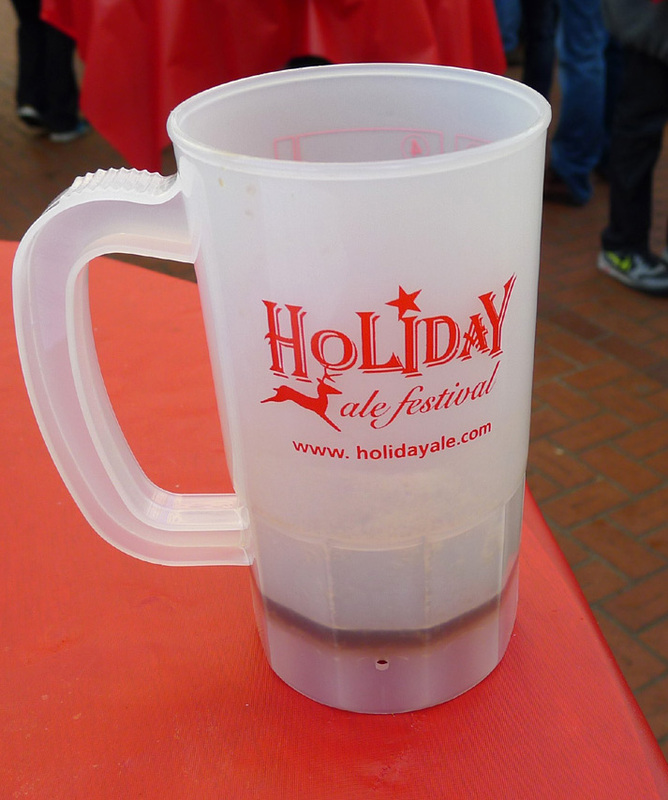 Time for the 17th Annual Holiday Ale Festival, which runs Wednesday through Sunday in Pioneer Courthouse Square. I talked about some of the general event specs earlier (here) and there are plenty of other folks talking about it in blogland. My main purpose here is to list a few of the beers I will be hunting for at the festival. Not that my opinion should really matter. Fact is, there will be a ton of great beers at the HAF, which is a destination winter beer event. Beer fans have come to expect a long list of unique and exceptional beers, because that's what the festival delivers. About my beer list. There are two tiers of beers at the HAF... Standard Release and Limited Release. All the beers on my list are from the Standard Release list. In case you wonder why, it's because the Limited Release beers will only be available during specific windows of time, not necessarily times I intend to be down there. Although I will almost certainly taste Deschutes' Lost Mirror Mirror Thursday afternoon, I'm not putting it on my hit list because its availability is so limited. If you want to plan your trip according to Limited Release beers, the list with tap times is here. Should you wish to get acquainted with the complete list of Standard beers, here's where you can find it. As I write this, the location of the beers in the tents is still TBD. That will likely be shored up by the time the festival opens on Wednesday. This is a Belgian Christmas Ale, based on a milk stout, with notes of molasses, toasted bread and raisins. Belgian Abbey yeast, with its essence of candied fruit, likely forms the character of this beer. Hops deliver hints of pine and bubblegum, they say. Sounds interesting. This beer started out as Bayern's award winning Doppelbock, and I'm a big fan of that style. They use a freezing process that lowers the temperature of the beer in the aging tank to the point that some of the water in the beer freezes. Several transfers from tank to tank extract the ice, resulting in a smooth, higher alcohol beer. I'll be interested to how smooth it is and how well the malt backbone keeps the alcohol in the background. This is organic collaboration combines Bison's award winning Chocolate Stout and Logsdon Farmhouse Ales' Bretta. The stout was brewed with cocoa, multiple yeasts, finished with strains of Brettanoymces, and then keg conditioned with pear juice. I've had both of the base beers. I'm interested to taste the combo and see how the Bretta alters Bison's very chocolate stout. This winter hop bomb is a collaboration between Breakside's Jacob Leonard and Bryan Keilty of Lompoc. They used flaked rye and dark wheat for malts. For hops, they turned to Willamette and Centennial. They rounded the beer out with a bit of honey for more body. This was one of the beers I didn't get to taste at Lompoc's Holiday Beer preview. Crux is one of the newer breweries in Bend and a very impressive operation. Snow Cave evidently doesn't stay within normal style guidelines. Instead, it gives a nod to all winter beer styles. Starting with a heavy dose of wheat malt and ending with a touch of chocolate, this high gravity interpretation of a winter warmer will keep you cozy in the harshest of winters. I can't wait! Last year, FW's Velvet Merkin was possibly the most popular beer at the HAF. This time around the Firestone folks have collaborated with the Holiday Ale Festival. In code, that means head HAF organizer Preston Weesner had significant input. It's a blend of one-year-old Bourbon barrel-aged Velvet Merkin that was blended with a touch of young Gueuze from Firestone's sour program. The result is a lighter, brighter, but still barrel-forward Merkin. Sounds excellent. A spiced Belgian-style ale was brewed in the spirit of holiday breads. Dark roasted malts and large quantities of molasses make a robust and slightly sweet body. Light hopping and spicing from vanilla, cloves, cinnamon and nutmeg create a festive finish. I'm interested to see if the spices can overcome the alcohol in this one. If you read this blog at all, you know I'm interested in this beer because when I tasted it at Lompoc's recent Holiday preview, it was freshly blended from barrels, under-carbonated and not ready for prime time. It's a Belgian red ale brewed in October 2011 using Belgian Ardennes yeast, then aged for a year in Cabernet Franc barrels. The resulting beer is malty and creamy, they say. I'm interested to see what the finished product tastes like. Any beer from The Commons is worth a try and this one sounds terrific. It's a dark, strong, malt forward Belgian ale with dark fruits added during maturation. Chocolate notes create a foundation for the boysenberries and yeast esters to ride on. Could be amazing! This is a revved up version of Brrrr, one of Widmer's winter seasonals. It's barrel-aged with hints of vanilla, dark chocolate and caramel. They say it has a deep complexity and balance. I honestly think standard Brrrr is a fairly bland winter beer, but the barrel-aged versions are a substantial upgrade. This will be fun. So that's my list. I'll undoubtedly be tasting other beers along the way, but this is a nice start. I'll post my thoughts on these beers and other finds before the weekend. It's going to be a fun festival. Hope you have a chance to get down there! Please go to the HAF website here to buy advance tickets and/or check event details. Oops...missing data point. Fixed now.